Today the fascination with the Life/Death cycle appears to continue with many who make the pilgrimage to the falls. Both honeymooners & suicidalist have been drawn to the sacred cataracts for opposite yet related reasons. 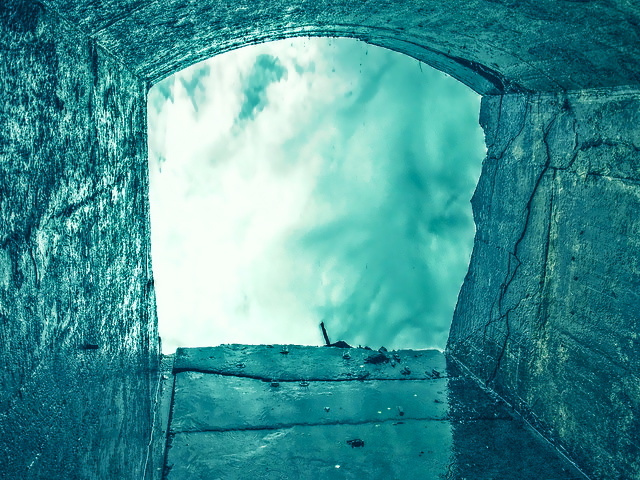 For the lost souls who decide to end their journey on the earthly realm, the subconscious belief may be this area is a portal or shortcut to the afterlife. For newlyweds Niagara is considered the honeymoon capitol of the world. Rumor has it, “There is something in the water” enhancing the possibility of conception and birth! As the cosmic trail of life and death weaves its way through Niagara’s landscape, there are also those daredevils who believe the thundering falls are the ultimate location for a test of fate. Could the legends of the sacred regions past be re-surfacing in our modern times? Could the Thundering falls be a Gateway/ Portal / Rainbow-Bridge between realms, dimensions and even the afterlife? Could cosmic knowledge be communicated between ancient stellar beings and “tuned in” modern humans? We shall dig into these questions following the trail of ancient mythology as well as modern symbolism. Hang on for a wild and cosmic ride as we …. 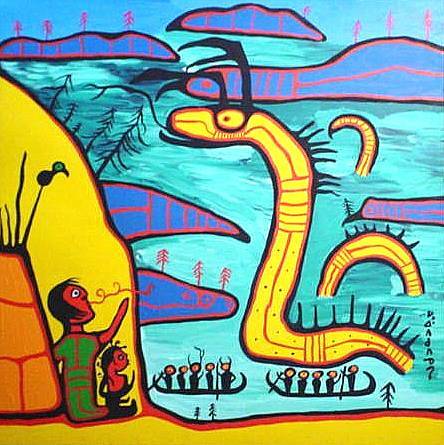 To many of the Native American tribes in the Great Lakes region, Niagara Falls was the dwelling place of otherworldly Manitous (cosmic-spirit-beings). The term Manitou can take on many connotations including; mystery, spiritual, mystical, supernatural, godlike, spirit like, transcendental and divine. One of the earliest native tribes from the area called themselves the “Onguiaahra”. 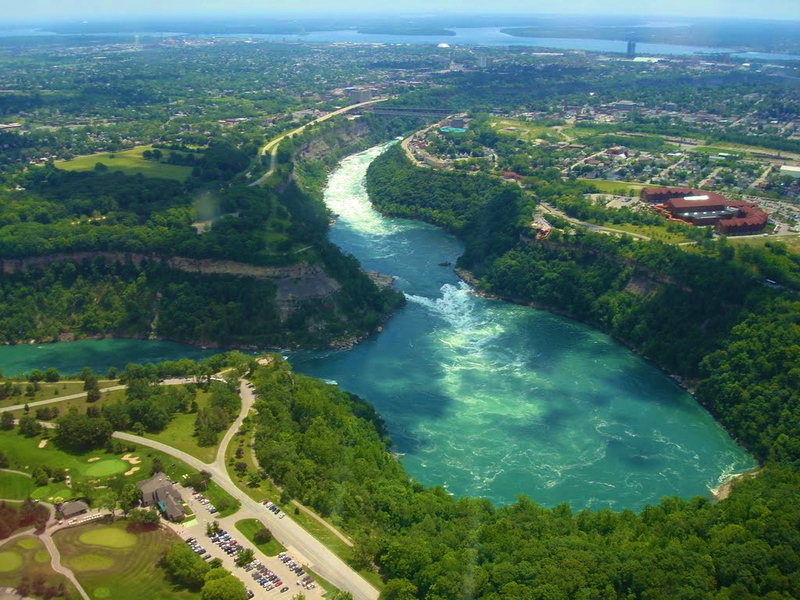 It is one of the names from which the name “Niagara River” originated. The French explorers that came to Niagara gave this Native American tribe the name “Neutrals” because of their position and status as peace keepers between several warring Native American nations – the Huron’s, the Seneca and the Iroquois amongst others. One commonality between the Native Nations was the belief in a cosmic battle that raged both beneath the falls in the underworld, and above in the heavens. This was a rumble between worlds, a battle for cosmic balance between the Thunderbird of the sky realms , and the Great Horned Serpent of the watery underworld. The battles between these manitouk were not perceived as contests between good and evil, right & wrong, light & dark but between the forces of balance & imbalance. The Thunderers (thunderbirds) are believed to reside in the upper worlds and sky realms. They take their name from the thunder (storms) that emanate from the flapping of their mighty wings. Lightning flashes from the gleaming eyes of the Thunderbird, many times in attempts to destroy his arch enemy of the underworld. The Thunderers sound their voices and put on a fantastic lightning show with their eyes, not merely for show but in many instances as a form of communication with human beings. In some legends communication and the transfer of knowledge takes place between humanity and the Thunderers. On more rare occasions the human is either morphed into a Thunderbird or given cosmic accouterments that allows them entry into the sky world. 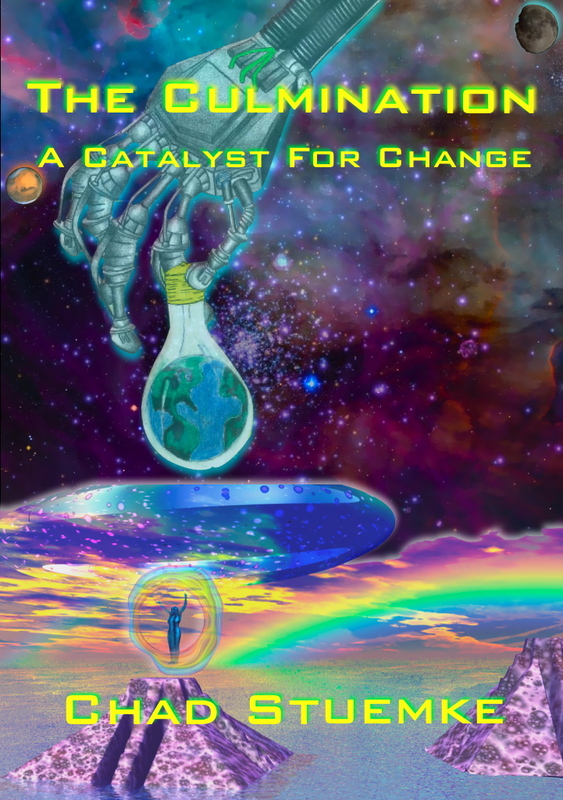 These stellar gifts that allow transportation between realms, possibly via portals & gateways, may include wings and/or magic feathers, shining (rainbow) robes, clouds (transcend space & time) and a possible journey over the Rainbow Bridge. The Great Horned Serpent was viewed by some of the Native American Nations as the ruler of the underworld. In other instances the Horned Serpents were perceived as a subservient group of underworld entities ruled over by the so called “King” of the waters Mishi-pi-shu (water panther). The attributes of the Horned Serpent and Water Panther correspond closely as they are both protecters of the watery deep and the realms that reside below, not to mention arch enemies with the Thunderbirds. These aquatic manitouk have several features symbolically linking them with extraordinary powers. Both their tails and horns have been associated with powerful and even otherworldly attributes. The creatures horns were thought be made from sacred copper, as was their swiftly moving tails. In the ancient world both humans and the supernatural strove to influence each other through ritual exchange in which copper was a medium. Power was even thought to reside within copper itself and was perceived as a medicine that brought wealth, health and even spiritual well being. The cosmic whirlpool (vortex) was the symbolic calling card created by the thrashing tails of the Horned Serpents & Water Panthers. This swirling & whirling water vortex was viewed as both a door to the underworld and a portal between realms. As the Thunderers rule the upper realms, and the underwater manitouk the lower worlds, they come into conflict on the earthly plain, the realm of humanity. Humanity left in the precarious position of not only observing & learning from these cosmic entities, but on occasion interacting with them. Following is an Iroquois legend pertaining to the previously mentioned cosmic duo as well as the infamous Maid of the Mist. Many years ago a young woman lived with her father’s sister in the village of Gaugwa, close to the great falls of Neahga. Her other relatives had died of the sickness which came each year to the people of her village. Although she was beautiful, hardworking and kind to everyone, she was not treated well. She was dressed in the oldest clothing and made to do the worst tasks. Despite it all, her beauty shone through the dirt and ragged clothes. Many men thought they would be glad to marry her, but her aunt would give no man permission even to visit their Lodge. As the years passed by, Ahweyoh – whose name means Water Lily-became more and more certain that she would never be allowed to marry. Sweaty Hands! Of all the men in the village there was no one more unpleasant. It was said that he beat his wife so badly that often she could not walk for a whole day’s journey of the sun across the sky. He was short and fat as a woodchuck in the summer and he never had a good word for anyone. He was even said to be a coward in battle. It was rumored that the wealth he had in his lodge had been gained only by treachery or by evil medicine. “Forgive me, my parents,” she said, raising her hands. “Now I must join you in death. I give myself into the hands of the Thunderers whose voices come from the great falls.” Folding her hands in heap, she sat calmly as the bark canoe rushed downstream, was lifted as if it weighed no more than a drifting leaf and catapulted over the lip of the great falls. She closed her eyes, waiting to he smashed to pieces on the rocks below. But, instead of striking foaming water and great stones, she felt herself land on something which stopped her fall. She opened her eyes. She was at the base of the falls. In front of her like a great wall of ice flowed the falling water and her face was moist with the mist. She was resting on a big blanket which was held firmly by three men. Ahweyoh looked at them and then looked quickly away. Surely this was a dream. They were dressed in warrior costume and on the head of each was a single large feather. They were more handsome and strong than any men she had ever seen before. “Nyoh,” Ahweyoh said. It was right. Though she had been badly treated by the aunt, she longed to see her own people again. Their son should know something of the human world. “Now listen well,” said He-noh. “These are matters of great importance. As you bring up our son you must remember to keep him hidden away. Tell no one who his father is. As he grows, caution him never to grow angry at anyone. As long as he remembers this, he can remain among human beings. Bearing her husband’s words in mind, Ahweyoh returned to her people at Gaugwa. Her face shone like a cloud touched by the sun and her clothing was so fine and beautiful that the people did not recognize her. But Sweaty Hands and the aunt thought this strange woman with a child whose face was covered in its cradle board looked something like that girl they had lost. To the Clan Mothers Ahweyoh spoke her words of warning with such simple eloquence that they were convinced of the truth. They in turn spoke to the Council of Elders and before three sunrises had come and gone the whole village had moved to Buffalo Creek. That night the monstrous serpent woke. It crawled through its burrows to poison the springs. Then it waited in a hole beneath the place where the Gaugwa people buried their dead. For the space of a moon it waited, yet no dead bodies were buried. Its hunger grew greater and greater. Finally it pushed its head out of the earth to see what was wrong. Around it was a deserted village. The monstrous serpent grew angry. How could they dare to move away! Scenting the trail they had taken, it came out of the ground, heedless of danger. It crawled into the lake where their canoes had gone and began to go up Buffalo Creek. At last the monster was dead. It began to float downstream and entered the river. Down it floated until it reached the great falls and lodged against the stones, its body stretching across the river like a broken circle. For a time the water was held back. Then a great piece of the falls broke away. The place where the monstrous serpent’s body became caught is today called the Horseshoe Falls. As the stones fell, they destroyed the place where the Thunderers had lived. Though the great falls still echo their voices, no longer would He-noh and his helpers dwell beneath the falls. Now the people of Gaugwa were happy. They gave great honor to Ahweyoh and built for her a lodge at the edge of the village. The baby grew to be a small boy crawling about the floor of the lodge, but still no one was allowed to see his face. Finally, one night, the aunt and Sweaty Hands could stand it no longer. They would go together and confront this woman who so resembled their Ahweyoh of old. If indeed she was that girl, she would be forced to marry Sweaty hands, baby or not! The aunt brought a willow switch and Sweaty Hands carried a stick which was shaped like a snake. Some of the people in the village saw where they were headed and thought to stop them, but a wise old woman shook her head. “Neh,” she said, “wait a bit. Those who think evil of others usually bring it upon themselves.” When the aunt and Sweaty Hands reached the lodge of Ahweyoh and her son, they paused at the door. A stick had been leaned across the doorway. This meant that those within the lodge did not wish to be disturbed. They paid no attention and pushed their way in. There, in front of a small fire, sat Ahweyoh. Across from her, his back turned to them, her small son sat, playing with some chips of flint. “Ha-a-ah,” said the aunt in her loud angry voice, “now I know you, my niece. You will come with us now and marry this man as I promised.” She stepped across the fire and grabbed Ahweyoh by the arm. raising the switch to strike her. Sweaty Hands stepped forward to grab Ahweyoh’s other arm, but as he did so he looked for the first time into the face of Ahweyoh’s son. Humanities place situated between cosmic realms is evident in many of the legends that surround the great falls. Transcending space & time we shall now explore stellar symbolism re-surfacing in the modern era…..
Mad Scientists, Honeymooners, Daredevils, Suicidalist, Oh My! For thousands of years Niagara Falls has captured the imagination of humanity. We know from ancient legends this region was perceived as a world between realms where earthlings observed, communicated and received knowledge from the cosmic manitouk. The falls Lunar Bow, Great Mist & Rainbow Bridge were also believed to be stellar transportation devices (portals) connecting this realm with the after life (Happy Hunting Ground). In the modern era Niagara Falls continues to stir the imaginations and emotions of humanity. The falls have maintained their reputation as a location in which the cycle of life, death & rebirth continue to this day! Today this cycle continues its spiral as both suicidalist & conceiving honeymooners test the waters. On a more rare occasion the legends of old appear to be seeping into the consciousness, and lives of those “tuned” into the cosmic falls. Could an open minded, scientific genius (mad scientist) have possibly tuned into the almighty Thunderbird of Niagara? In my research I have came across a mystical phenomenon, particular people appear to tune into sacred landscapes and take on aspects of not only the cosmic landscape, but on occasion the archetype of the mythological beings surrounding the landscape. 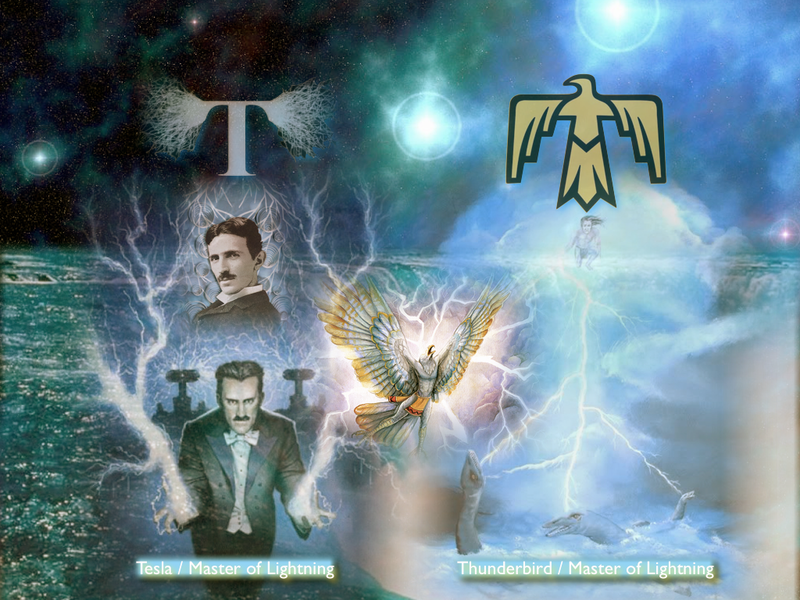 Could Tesla have “tuned” into the mythological Thunderbird, possibly even taken on the Birdman archetype? Tesla was a genius, scientist and inventor. Many of his inventions have literally changed the world! A few of his gifts to humanity included X -rays, radio, remote control, electric motor, wireless communication & alternating current to name a few! 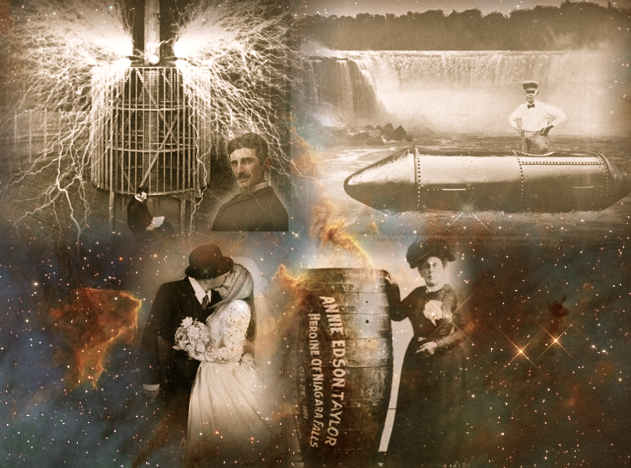 Nikola Tesla as a boy in Croatia “DREAMED” of harnessing the energy of the almighty Niagara Falls. Years later he would make this dream a reality using AC current, extracting energy from what he referred to as “Niagara’s Power Portal”, lighting cities for hundreds of miles for the first time. After “tuning” in to Niagara and fulfilling his boyhood dream, Tesla appears to have taken on several aspects or even the archetype of the Thunderbird! -Tesla began dreaming of flying and creating machines to fly, as does the Thunderbird. -Tesla fell madly in love with a pigeon while living out his final days in a New York hotel room. Amazingly the pigeon took on many of the same attributes of the Thunderbird. 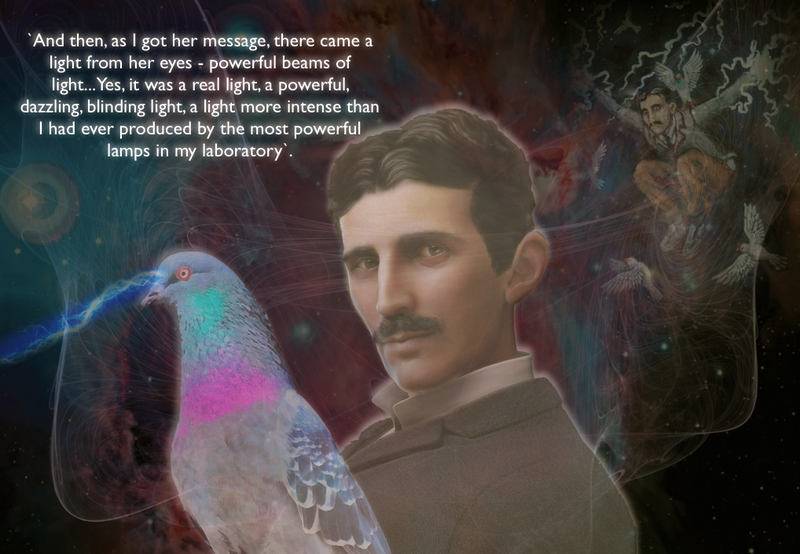 Tesla felt his pigeon could communicate to him the answers of the universe. Upon the birds death Tesla claimed to witness the brilliant light he had ever seen beam from the pigeon’s eyes (sound familiar…. 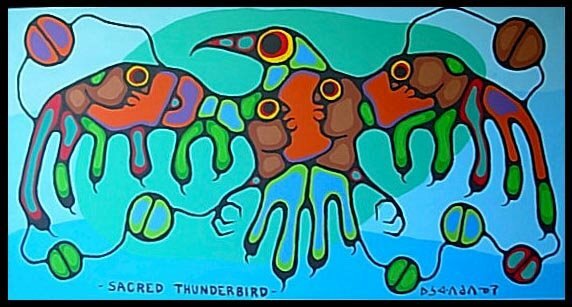 Thunderbird)! “Yes, I loved that pigeon, I loved her as a man loves a woman, and she loved me.” If the pigeon became ill, he would nurse her back to health and as long as she needed him and he could have her, nothing else mattered and there was purpose in his life. After the dove`s death, something disappeared from Tesla`s life. He knew his life`s work was done for good. Shortly thereafter Tesla followed the mysterious dove (Thunderer?) into the afterlife. 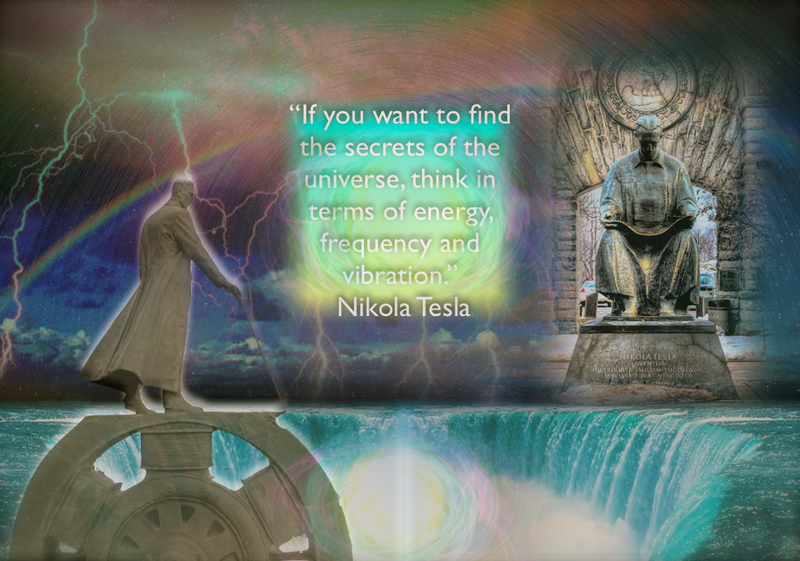 While Tesla was drawn to the falls through dreams and visions, in hopes of harnessing its energy, others see the enormous cataracts as the ultimate test of fate! For some daredevils Niagara provides them with an opportunity to take a symbolic leap of faith. Stunts have included folks going over the falls in barrels, jet skis, walking tightropes and even going over the edge with no accouterments at all. Although some have survived the leap, others were not so fortunate. The common denominator appears to be these daredevils are perceivably at peace with the sacred falls possibly being their final resting place. One such dare devil was Annie Edson Taylor. She was an American adventurer who on her 63rd birthday, October 24, 1901, became the first person to survive a trip over Niagara Falls in a barrel. After climbing inside her airtight wooden barrel, the air pressure was compressed to 30 p.s.i. with a bicycle pump. Annie was protected by nothing more than a few blankets and her favorite heart shaped pillow. Surviving the plunge with only a few bumps and bruises, Annie became the first in a long list of daredevils to plunge over the falls tempting fate. While daredevils tempt fate taking symbolic leaps of faith from the falls, the occasional lost soul may visit the falls with their fate predetermined. A final destination. Each year, on average, between 20 and 25 people decide to end it all at Niagara Falls. Local historian Paul Gromosiak once wrote that 2,780 known suicides occurred here between 1856 and 1995, having compiled his grisly list from newspaper accounts of witnesses seeing someone jump or of bodies recovered in the lower river. The actual number, he acknowledged at the time, is probably much higher as many of the bodies are never recovered. The souls of the suicidalist enter the afterlife via several general locations around the falls. Many decide to go over the falls, some leap from the Rainbow Bridge and yet others take a final wade into the turbulent whirlpool. Is it possible that some of these suicidalist subconsciously recognize that the veil between worlds may be thinner here. Could the falls and the surrounding landscape be a gateway to the afterlife & beyond? If so, could it also be birth portal? Historically, Niagara Falls was established as the ideal honeymoon destination by the French in the early 1800s. It has been said that Napoleons brother, Jerome Bonaparte, travelled by stage from New Orleans to spend his honeymoon in Niagara Falls and returned home with flowing reports. Since this time Niagara Falls has become known as the HONEYMOON CAPITAL OF THE WORLD. Honeymooners feel Niagara Falls has a mystique unequalled anywhere. Not only is the awe inspiring beauty and amazing history a draw, but rumor has it, “There is something in the water.”! That “something” in the water supposedly can both act as an aphrodisiac & increase the chances of conception (birth)! Imagine that…… while some are leaving this realm for the next (at the precise location that felt right), others are conceiving & birthing life into existence. Could there be a life/death cycle occurring? Could the veil between worlds be thinner around this sacred & cosmic landscape? And last but not least, could there really be “something in the water”? Is it possible the worlds largest natural negative ion generator is contributing to the “honeymoon effect”? Could the ionic mood elevators be acting in part as an aphrodisiac for lovebirds hoping to conceive? Many others have journeyed to the falls determined to end it all, yet upon soaking up the magnificent environment, and a few deep breaths of air, a change of heart may occur. Hopes for a new day bubbling to the surface. 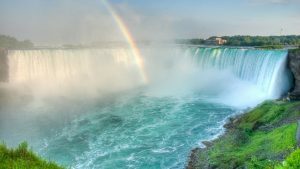 Considering the ancient legends in conjunction with the modern life/death cycle phenomenon, Niagara truly appears as stellar doorway between worlds. Could coinciding cosmic symbolism also make an appearance around and beneath the falls. Our journey thus far has revealed the possibility of Niagara Falls being a cosmic landscape situated between otherworldly realms. The raging confrontation between the heavenly Thunderbird and their arch enemy, the underworld manitouk, was a battle for both earthly & cosmic balance. Humanity was positioned on the earthly realm, between opposing forces & worlds, giving us the opportunity to both witness and learn from them. The thin veil between worlds continues to lift into modern times, as suicidalist leave this realm for the next, and honeymooners conceive, birthing life into existence. Ancient legends encompassing the falls, in conjunction with the modern life/death cycle phenomenon, bring up the possibility of Niagara Falls (on some level) being an an otherworldly gateway. Could it be a doorway, window, portal or even a “stargate” between realms. If the perceivable veil is thinner surrounding the falls, would there be any modern day symbolism in the vicinity to back up this scenario. Is it possible cosmic symbolism has filtered through the thinning veil, working its way into art, architecture, & even natural landscapes? 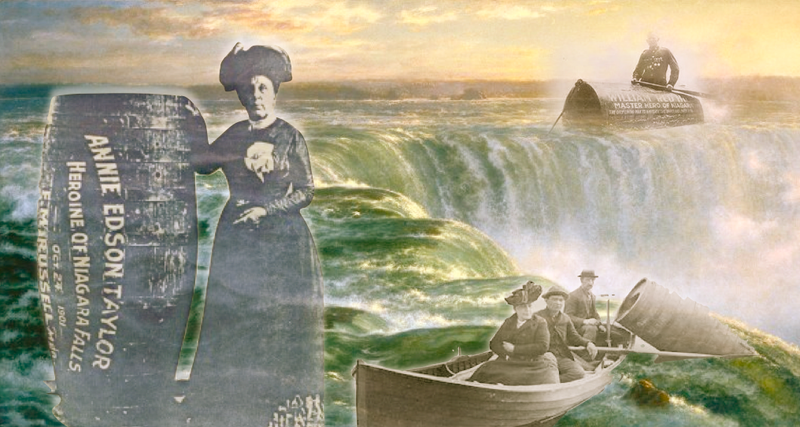 One example of the re-surfacing of Niagara’s ancient lore within modern symbolism is “The Maid of the MIst”. Recall the legend of the Native American maiden who surfed over the falls only to be rescued by the Thunderers. Her spirit symbolically roams the waters beneath the great cataracts on a daily basis as a tourist vessel. 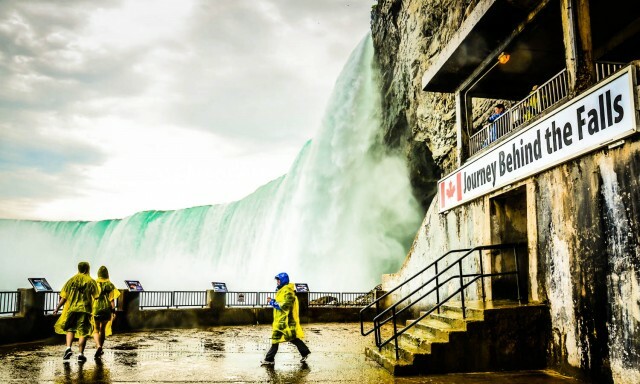 The first Maid of the Mist was launched in 1846. 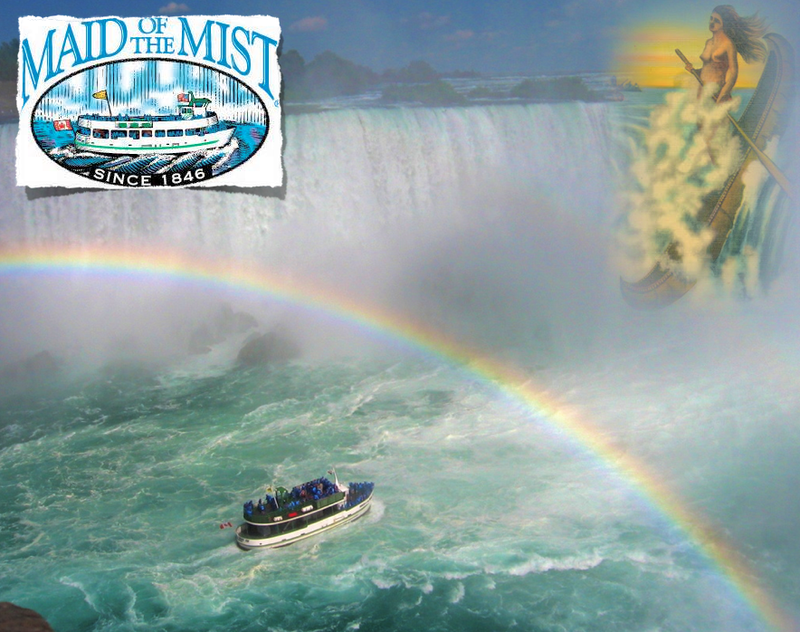 The boat starts off at a calm part of the Niagara River, near the Rainbow Bridge, and takes its passengers past the American and Bridal Veil Falls, then into the dense mist of spray inside the curve of the Horseshoe Falls. 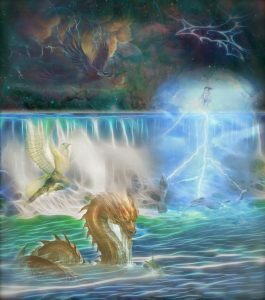 * Symbolically its important to note the Maiden launches from the Rainbow Bridge (gateway between realms), before viewing Bridal Veil Falls (previously called Iris Falls – Iris = Goddess of the Rainbow). After the rushing waters plunge over the ancient falls they then flow beneath the highly symbolic International Rainbow Bridge which opened in 1941. 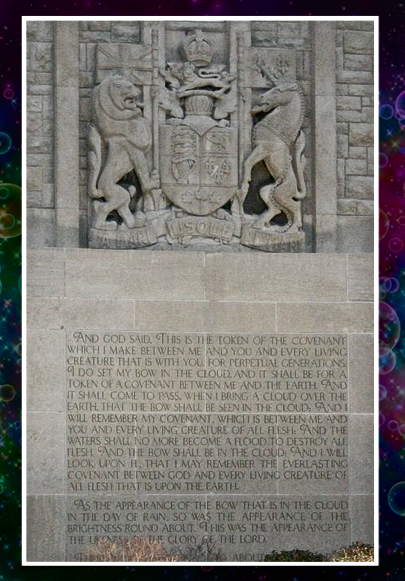 The origins of the name likely inspired by Genesis 9:12–17 which is engraved on the adjoining Rainbow Tower. The Rainbow Tower houses a carillon — a musical instrument consisting of a baton keyboard that controls a series of bells. Tunes & tones emanate from the Rainbow Tower 5 times a day, 365 days a year. On the side of the Rainbow Tower are several biblical engravings pertaining to the Rainbow Bridge. The rainbow and the symbolism it incorporates has always been viewed with a sense of awe, wonder and inspiration. The shimmering and glistening colors that emanate from the “path of the gods” has illuminated and inspired ancient cultures and their mythologies as well as poets artists and even scientists. Symbolically speaking, in many mythologies worldwide the Rainbow Bridge, or the “Shimmering Path” as it is sometimes referred to, was seen as a communications link between the earthly realms and the heavenly realms. 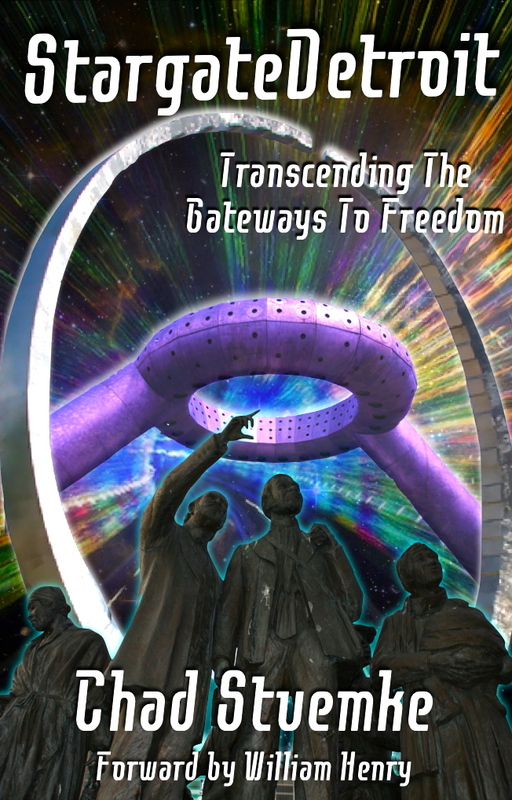 The Rainbow Bridge was considered a pathway connecting humanity to the gods, and possibly even ourselves to our higher selves. 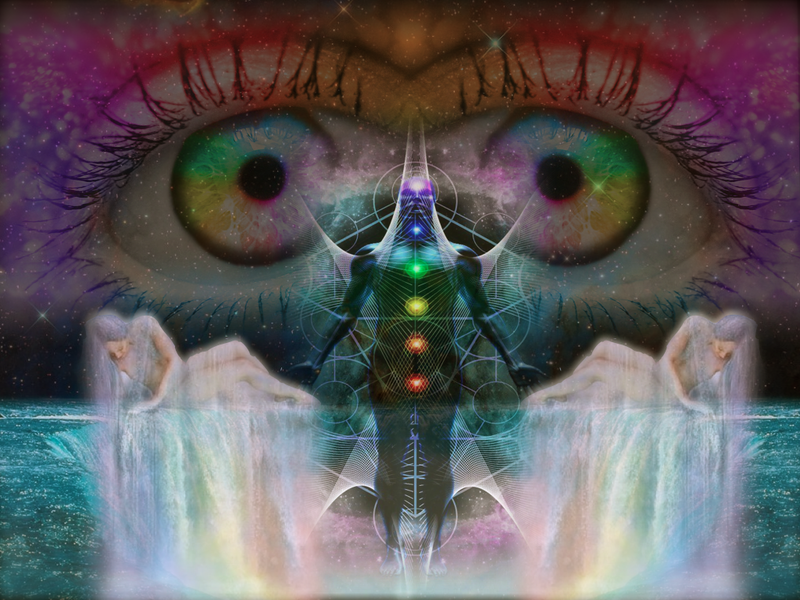 The cosmic bridge symbolically is a portal or gateway between worlds. Synchronistically, the rainbow goddess Iris has made her heavenly presence known over the years via the naming of several sacred land features. What is now known as Goat Island was once entitled Iris Island, and Bridal Veil Falls was once Iris Falls. In Greek mythology, Iris was the personification of the rainbow and messenger of the gods. She linked the gods to humanity via the rainbow. After plunging over the falls and flowing under the Rainbow Bridge, the turbulent waters then enter the swirling whirlpool! The Niagara Whirlpool is a natural phenomenon located downstream from the brink of Niagara Falls. The Whirlpool is a large body of water, about 125 feet deep and 1200 feet across, that circulates counterclockwise creating one of the largest natural whirlpools in the world. The rotation is caused by the Niagara River taking a 90 degree right turn, creating the opportunity for the water to rotate. When the Niagara River is at full flow, the waters travel over the rapids and enter the pool, then travel counter-clockwise around the pool past the natural outlet. Pressure builds up when the water tries to cut across itself to reach the outlet and this pressure forces the water under the incoming stream creating a swirling vortex. Symbolically the swirling water vortex was perceived as a portal between worlds. Native American legends portrayed the whirling-pool as a remnant of the underworld deities (water panther & horned serpent) thrashing tails as they exited or made entrance into the earthly realm. It was a tell (tail) sign the cosmic manitouk had ventured in between realms. Protruding into the Niagara skyline are two more examples of cosmic symbolism. 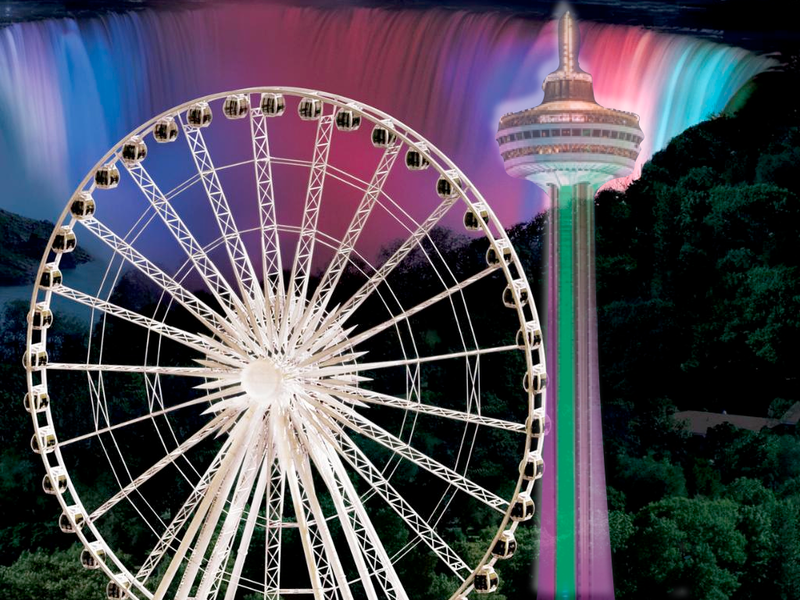 Together the Sky Wheel & Skylon Tower can be perceived as a representation of cosmic balance. The tower symbolic of male energies, and the ring those of the female. Separately the monuments take on several stellar aspects of their own. Both the Sky Wheel & the Skylon give the visitor the opportunity to view Niagara’s sacred landscape through the birds eye view (Thunderbird). The Skylon Tower rises 520 ft. from street level and 775 ft. from the bottom of the falls. It was completed in 1965 and done in a cosmic form of architecture known as Googie! Googie architecture is a form of modern architecture, a subdivision of futuristic architecture influenced by car culture, jets, the space age and the atomic age. The Skylon took on aspects of the Googie space age influence. The tower reaches toward the heavens like a giant space antenna or cosmic receiver. The tower is topped by a disc shaped flying saucer! The saucer is capped by copper and serves as both an observation deck as well as a rotating restaurant. The Sky Wheel is a 175 foot ferris wheel that transports the visitor high above the falls allowing for unparalleled views. Most likely subconscious symbolism, the spinning wheel takes on several aspects of a stargate!. 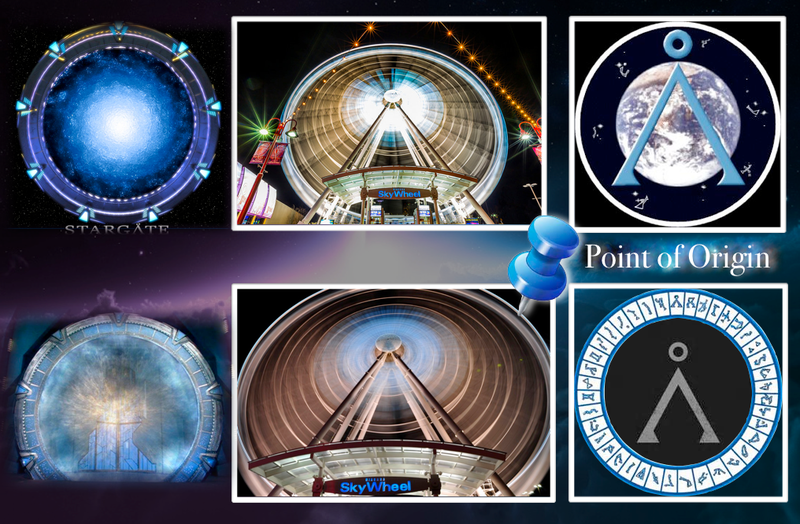 Not only does the sky wheel appear as a portal (stargate) in time laps images, but it happens to actually incorporate stargate symbolism within its design. The “Point of Origin” symbol is used as point to return to after traveling through space and time. Our Point of Origin is in general Earth, yet many cities have their own Point of Origin markers. The Point of Origin is symbolized by a pyramid with an open bottom. Synchronistically the Sky Wheel incorporates this symbol as a centerpiece of its structure! As we have discovered, Niagara appears to be a realm situated between cosmic dimensions. Symbolically, the stellar transportation devise between these realms would be a gateway or portal. Could there be any portal symbolism to coincide with this possibility? Between the falls is the sacred Goat Island (previously Iris Island). There a sculpture of Nikola Tesla (bird-man) which memorializes his accomplishments in regard to harnessing the energy of the falls. 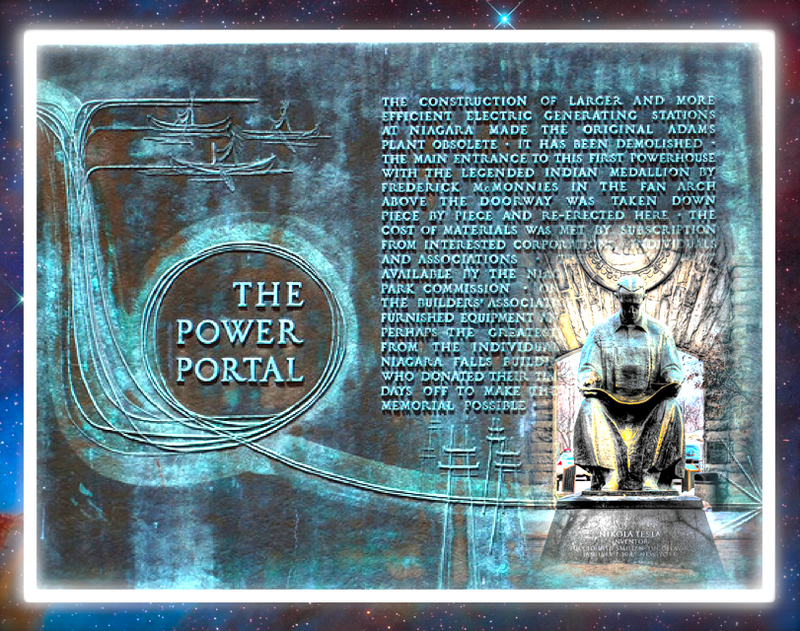 Telsa’s boyhood dream was achieved when he successfully tapped into, and harnessed, “The Power Portal”! Legend has it beneath the falls was home to the chief of the Thunderes (thunderbirds), and was a portal to the sky realms. Today you can take a Journey Behind The Falls and view the them from the perspective the ancient Thunderers would have. Keeping with our theme of cosmic symbolism, it should come as no surprise that the otherworldly viewing areas below the fall are referred to as portals! 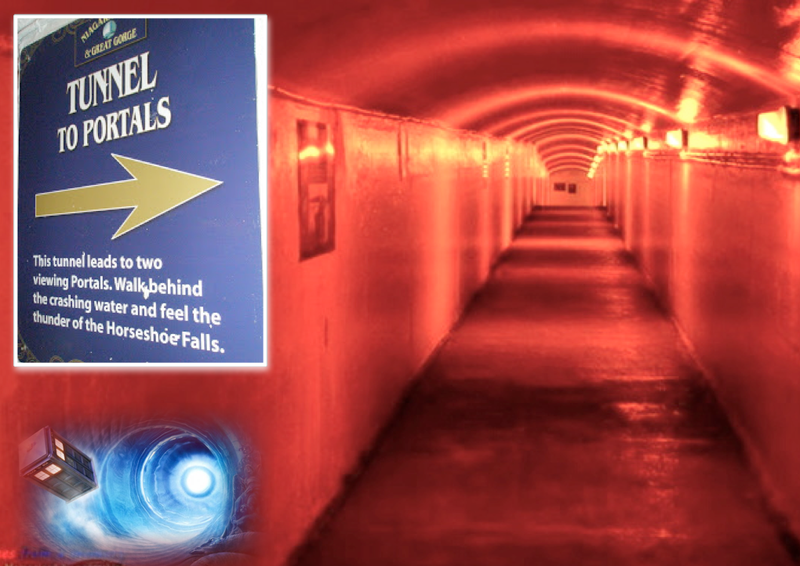 To locate the water portals the visitor follows a tunnel that rather resembles a wormhole! 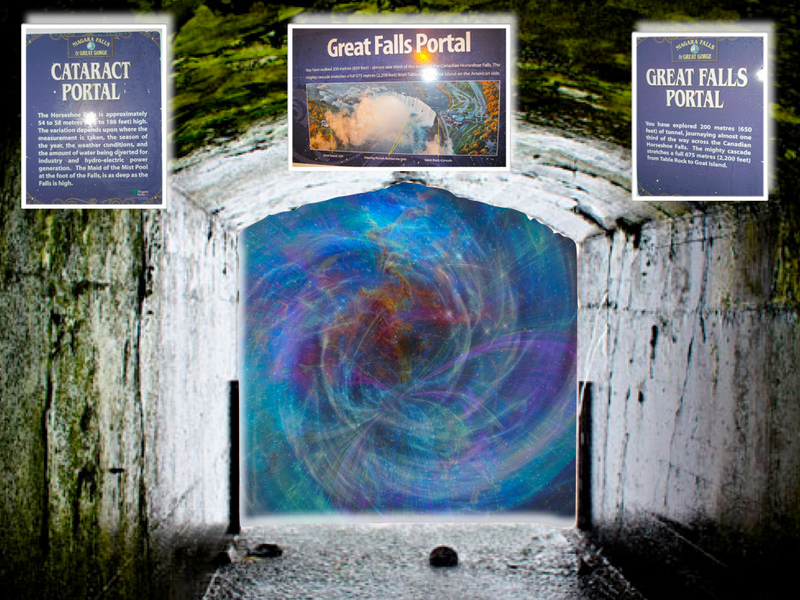 The wormhole tunnel leads to several different portals including the Cataract Portal, and the Great Falls Portal. 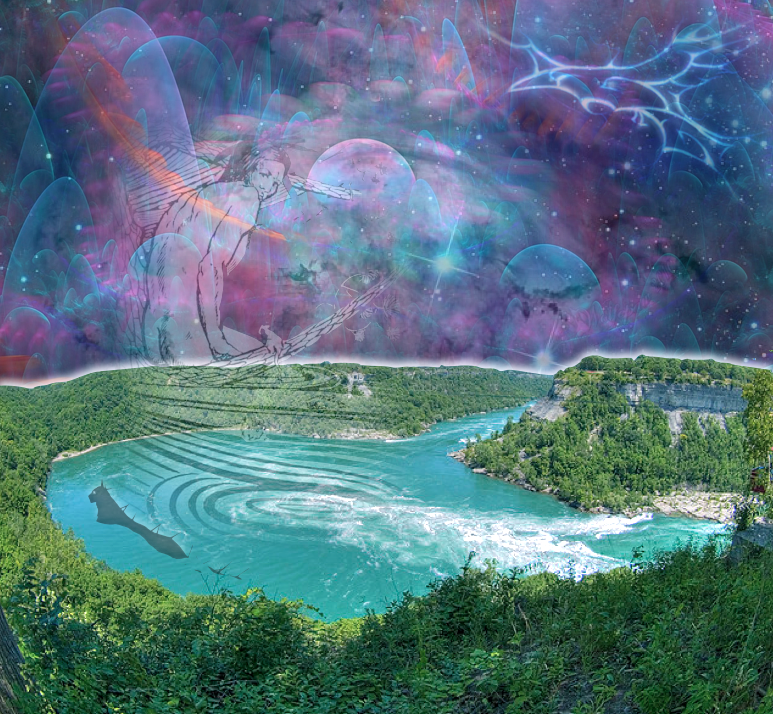 Could Niagara Falls be a cosmic landscape situated between otherworldly realms? Could the legendary underworld, Niagara, & the sky realms be connected, and even accessed, via stellar doorways or portals? 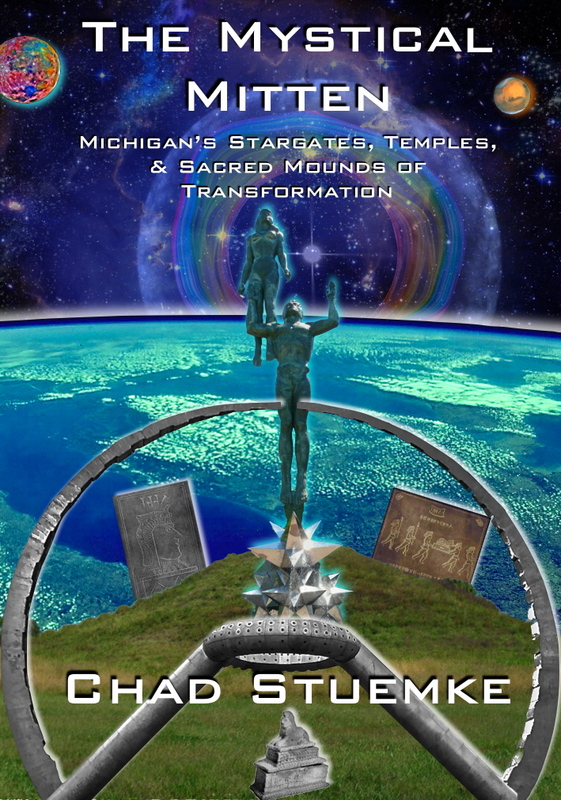 Local legends depict cosmic beings traveling between space & time, life & death, through portals & cloud gateways. 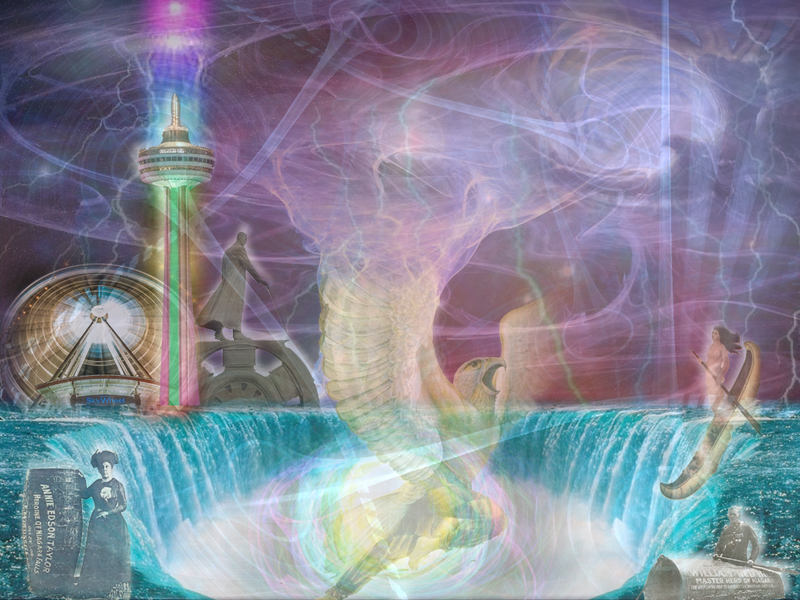 The same legends depict niagara & several of its natural features as catalyst to accessing these realms. In recent times daredevils, honeymooners, & sucidalist have continued to tempt fate and the life/death cycle. Could they too have subconsciously recognized the veil was thinner at NIagara (so to speak)? 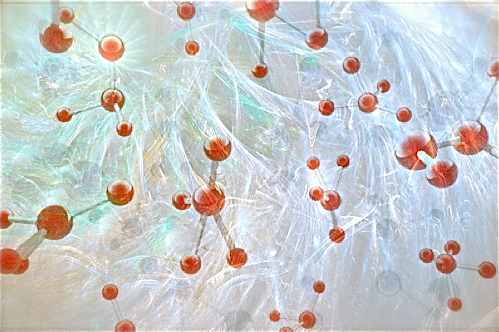 Today a cosmic mist still pervades the air. Cosmic symbolism has re-surfaced into the modern era. The “Maid of the MIst” once again floats upon the sacred waters. 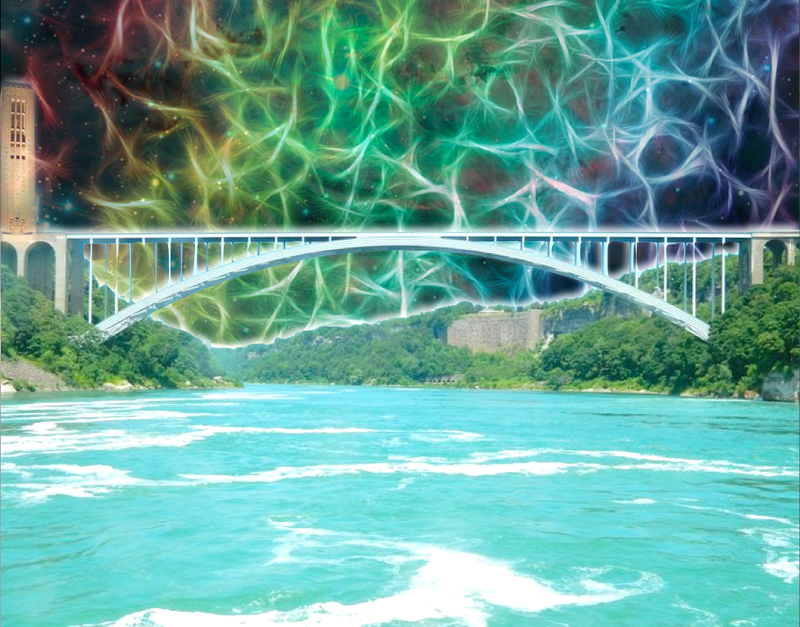 The waters flow beneath the “Rainbow Bridge” before entering the “whirlpool – vortex”. “Portals” beneath the falls allow us to visit the realm of the Thunderers. 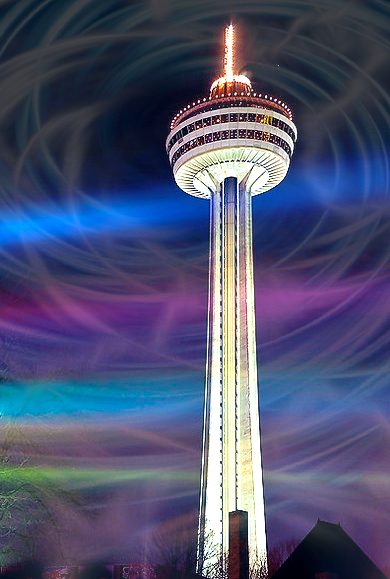 A “Googie” (space age) tower rises into the heavens appearing as cosmic antenna (transmitter – receiver) capped with a symbolic U.F.O..
Could Niagara be a Cosmic Landscape sandwiched between otherworldly dimensions, a stellar portal between realms?